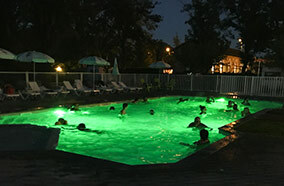 The heated pool at 28 ° C of our campsite 3 stars in the Dordogne is suitable to accommodate young and old. She welcomes you from mid-May to mid-September to spend pleasant moments in the water. 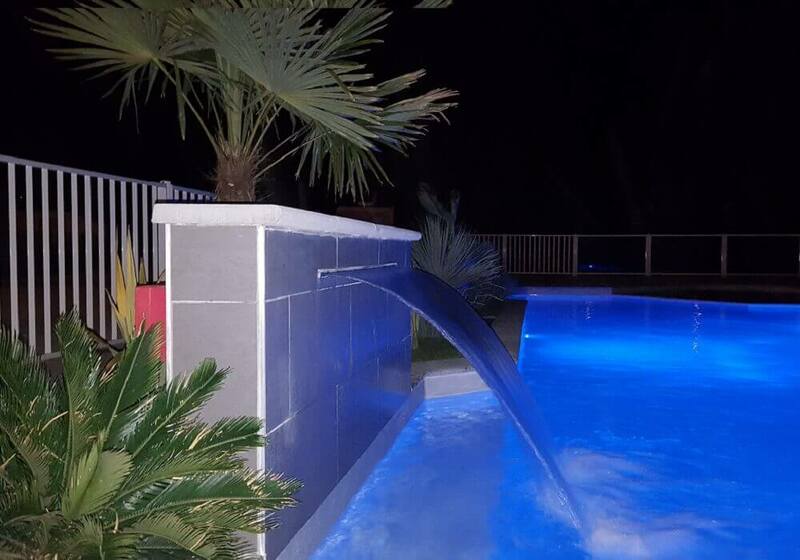 Our bathing area in the Dordogne consists of a large pool with a depth of 1.30m and a paddling pool. 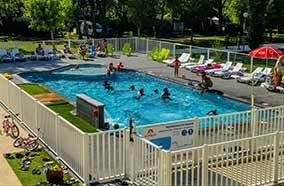 The campsite swimming pool in the Dordogne is ideal for both swimming and children’s play, in complete safety. The water of our heated swimming pool is at 28 ° C permanently for the comfort of all. 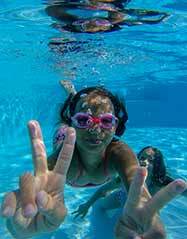 The wading pool adjacent to the pool allows parents to monitor their children while relaxing on the submerged bench. To appreciate even more this moment of relaxation the basin is equipped with two benches, one near the paddling pool and the second under the waterfall. On the wide beaches around the pool, you relax in the sun or in the shade of a parasol. You choose between chairs or armchairs in number. In the morning, before the opening of the pool, we reserve a time slot for athletes who wish to perform pool length after a dip in the water. Once a week in summer, the pool turns into night mode. Indeed we turn on multicolored spots and we open the pool until 22H30. And it is you who make the show, the lights in the wavelets of the water provide a splendid rendering. And if swimming does not appeal to you, you can simply be spectators. Whatever the color, blue, green or red, children and adults alike will have fun in a warm and colorful atmosphere.